Collapse of bee colonies poses severe threat to future crops. Case of vanishing bees has caught the public's imagination. Editor's Note: Bayer Crop Science declined to be interviewed for the making of Vanishing of the Bees and did not respond to CNN's request for a statement or interview. (CNN) -- Around the world, bees are dying in their millions and there's something in this mysterious, silent tragedy that has seized public consciousness. Since Pennsylvanian David Hackenberg first identified the problem of Colony Collapse Disorder (CCD) in 2004/2005, beekeepers all over the world have found their hives suddenly empty. 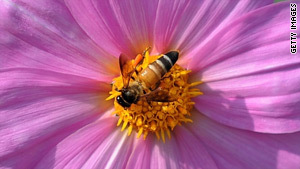 Bees pollinate a third of our crops and without their help our diet would be very different. Not only are people worried, but the decline has somehow become a broader metaphor for our relationship with the environment. Sensing that something was very wrong, two documentary filmmakers decided to investigate the problem and the result is new movie, "Vanishing of the Bees". "I found out about CCD from a friend and immediately went home and looked online to find out more about it," George Langworthy, co-director of the film, told CNN. "I was immediately captured by the mysterious and global aspects of it. I knew I had to do something about it." Over the next two years the filmmakers crossed the globe talking to beekeepers in an attempt to pinpoint the cause. Their film opens in the Australian outback as men in bright white protective suits blast hives with smoke before sifting and pouring the bees into small boxes. The thousands of tiny creatures are then loaded into the hull of a 747 and flown across the world to California, where they will be used to help pollinate crops. This bizarre state of affairs has become necessary because modern, mechanized agriculture is based on vast monocultures -- tens, perhaps hundreds of acres of a single crop. Because these crops only flower once there is nothing for bees to eat for most of the year, yet they are still vital for pollination, so farmers have to ship hives in to pollinate the crops and rent them out for up to $200 per week. It's in this context of heavily industrialized agriculture that bees began to die. At first no one was sure what the cause was. Was it a new disease? Or infestation with the parasitic Varroa Mite? Was it because the bees were stressed by being shipped around? Was it cell phone masts? Or just bad beekeeping? Even terrorism was put forward. The film examines the evidence for this confusing tangle of theories, but it ultimately settles one another cause altogether: pesticides. Agricultural monocultures depend on vast quantities of chemical inputs to stay fertile and free from pests. Huge areas of the same crop are extremely attractive to the pests that feed on them, and many of the natural checks and balances provided by predators in more balanced ecosystems don't exist, meaning chemicals are the only way to avoid large losses. These pesticides aren't intended to kill bees. But, according to filmmakers, around the time bee deaths started being reported, a new type of neonicotinoid-based "systemic" pesticide produced by Bayer Crop Science and other agrochemical companies was deployed by farmers. The new pesticide is either placed in the seed, and remains in the plant for its lifetime, or is delivered through irrigation systems. Both the makers of "Vanishing of the Bees" and many beekeepers believe it is at the heart of the problem. Although Bayer's tests have confirmed that the chemicals are not toxic to bees in the short term, according to the filmmakers and beekeepers interviewed for the "Vanishing of the Bees", the long-term impacts have not been studied, nor the effects of the combined pesticide residues being found in hives. The conclusion of film is that these nerve toxins are weakening and confusing the bees, disrupting their sense of direction, leaving the vulnerable to disease and infection -- and this is why they are dying. "Personally I like to explain it that it's not just one specific type of pesticide that is responsible for CCD, more a whole system of farming," said Langworthy. "I think it's our mindset that is the problem - the idea that if we don't use all these toxic chemicals then we won't be able to grow food, and that's completely untrue. "The problem in all of this is you have these big companies working to try and convince us that we can't manage without their product." Completing the documentary and bringing these ideas to the public has become a personal crusade for the filmmakers. "The film has completely put us in debt," Maryam Henein, the film's director told CNN. "George is facing bankruptcy, and I haven't earned a dime in three months. "Right now, we don't know how we'll pay the rent. So the success is quite bittersweet: we've got a theatrical release in the UK and had this great premiere; but then every day it's easy to be fearful." In the UK the film has been distributed by the Co-Operative Bank and Dogwoof, whose partnership is intended to help bring socially conscious filmmaking to a wider audience. UK retailer Co-Operative Food has already banned neonicotinoid-based pesticides on its own-brand fresh produce and called on the Government to fund research into their effects. But the team behind "Vanishing of the Bees" are still hoping for more support "to bring this message to the rest of the world", particularly the United States. Henein believes that through it all, the bees themselves are supporting them. "They started appearing in my life," she said. "There was one point early on when I was doing the dishes and looking out my kitchen window wondering, 'What am I doing? We have no money,' and a single bee came and touched the window and left. Another time I walked through a whole swarm of bees and they just flew through me and around me." Despite the scale of the problem, Langworthy remains sure that change is possible and insists the film has a positive message. "It's made me more optimistic about the ability of people to affect change in the world," he said. "The general public can become aware of these key issues and do something about it. "It's been very inspiring how many people are concerned about the bees and people can really make a difference, by eating healthier food -- which is better for them -- and planting their garden -- which is a wonderful thing to do. They can really see the difference in front of their eyes as opposed to abstract things in the rainforest or the ozone layer." Henein hopes the film will act as a catalyst for much more wide-ranging changes in society. "The way that we are living and the systems around us are outdated and stale," she said. "I'm a spiritual person and I really believe that we are on the verge of a new paradigm and we have to be the change we want to see. It'll take some sacrifices and it won't be easy, but it really starts with us. We need to learn from the bees -- they work in common unity and that is a lesson for us all. "We're at a fork in the road, and you have to decide if you are going to be part of the people who are positive and want to live beyond fear, or are you just going to live in a box?"